As puppies get older and learn more about their surroundings, they also tend to learn a bit about their bodies and what they can do that can be surprising. Buck is a Heeler that is 8 weeks old. He was taking a trip with his owner in the car, sitting in the front seat so that he could be watched over until they got back home. 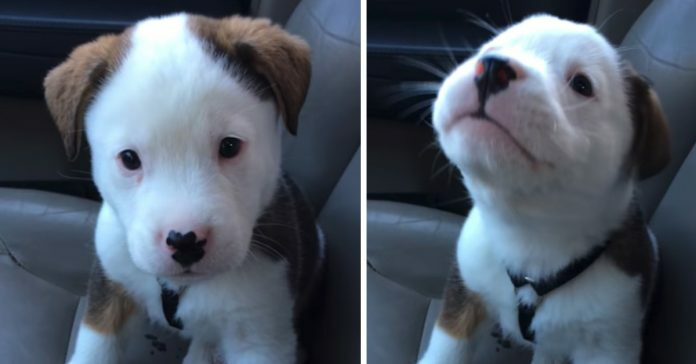 While the puppy was in the car, he got the hiccups. This was the first time that Buck had the hiccups, and he was a little surprised at what was happening. After a few minutes, Buck tried to scare his hiccups away. Since he can’t see them and doesn’t know where they are coming from, he starts growling and barking. Frightening them away doesn’t really work. However, his hiccups do subside. Even though Buck has many more lessons to learn, this is one that has left viewers laughing because of how adorable the puppy is and how he thinks it’s easy to just scare off a case of the hiccups instead of letting them run their course.